Every year, the heart of Hellenism beats strongly all over the United States as Hellenes and Philhellenes celebrate the anniversary of Greece’s 1821 War of Independence from Ottoman rule. The example of our ancestors expresses the true Hellenic values of heroism, duty, and self- sacrifice. It is therefore the duty of the American Hellenic Institute (AHI) to support the nationwide efforts of organizations and communities working hard to keep the tradition of celebrating Greek Independence alive and with that the spirit of our ancestors to helping us strengthen Greece’s role as a stable, credible power of peace and safety in the Balkans and in the wider region of the southeastern Mediterranean. 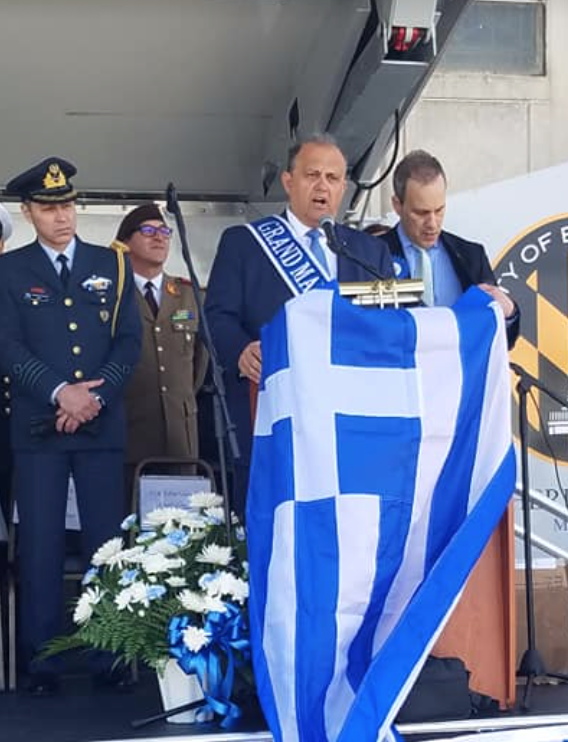 It is within this Hellenic spirit and values that AHI President Nick Larigakis accepted the honor to serve as Grand Marshal at the annual Greek Independence Day Parade in Baltimore, March 31, 2019. In his address from the grandstand, President Larigakis reminded the community that despite the heroic sacrifices and battles our ancestors have fought “the struggle continues.” These sacrifices and battles constitute the backbone of the critical duty we have as a community to continue reminding members of Congress of Turkey’s acts of aggression in the Aegean Sea, continuous occupation of the Republic of Cyprus, and suppression of the Ecumenical Patriarchate’s religious freedom, each constituting grave violations of international law and principles. President Larigakis congratulated George Stakias and the organizing committee for hosting an outstanding parade and expressed his gratitude to for honoring him with their selection. During his speech at the April 13 Parade Dinner Larigakis reminded the audience that as the leading parade in the United States, we are not only honoring the 198 years of Greek Independence, but we also honor the great achievements and successes of the Greek American community. “No one embodies that more than the parade’s Grand Marshal, George Marcus,” Larigakis emphasized. Strong AHI support was present in the Philadelphia Parade Festivities as well, whereAHI Member Georgia Halakos serves as President of the Federation of Hellenic American Societies of Philadelphia and Greater Delaware Valley, the organization responsible for hosting the Parade on April 7 and the annual Eleftheria Banquet, on March 30, 2019. Community leader, Dr. Spiro Spireas, a Board of Directors Member of AHI Foundation and Former President of AHIF has been a major benefactor for many years to the Philadelphia Parade. Georgia Halakos and Dr. Spiro Spireas were joined by President Larigakis, AHI Board Member Demitrios Halakos and fellow members of the Order of Saint Andrew the Apostle – Archons of the Ecumenical Patriarchate. The Parade was headed by the Consul General of Greece in New York, Konstantinos Koutras who served as the Grand Marshal. At festivities held for the Greek Independence Day Parade in Tarpon Springs, Fla., March 31, 2019, AHI Member George Mermelas was honored by the parade’s organizing committee for 30 years of service and support to the annual event. In the heart of Washington, DC, President Larigakis, and AHI Board Members Dr. Athina Balta and Demitrios Halakos, celebrated Greek Independence Day at the White House attending the ceremony officiated by President Donald J. Trump and His Eminence Archbishop Demetrios, Geron of America on March 18, 2019. President Trump emphasized the “robust” partnership between Greece and the United States and the momentum it has gained steadily during the past year. AHI President Nick Larigakis with Katerina Panagopoulos, Special Advisor to the Prime Minister of Greece for Hellenic Diaspora, Greek Defense Attache Col. Vasileios Lampropoulos, Naval Attache Cpt Charalampos Peglidis, Air Attache Col. Stefanos Ampouleris.